lechemusic: ¡Nico Purman – Fade Away! Fantastic funky house by Argentinian Nico Purman. lechemusic: ¡Cantinabend – OK (Original mix) lechestyle: Hackett HRFC rugger! Italian house / nu disco producer Cantinabend’s track OK is featured on Stardust Records latest summer compilation. The track is full of positive energy as is indeed the whole compilation. I have sort of mixed feelings about rugby shirts. Some of them are very nice but often let down by huge logos that make you look like you are sponsored by the brand. This striped one by classic British brand Hackett on the other hand suits my taste very well. lechemusic: ¡Saint Petersburg Disco Spin Club & Lipelis – I Need It (Official video)! Have a listen to funky beats from Russian producers Saint Petersburg Disco Spin Club & Lipelis. The track is really catchy, and it sounds exactly like something the Magician would put in his next magic tape. Fun video as well, vinyl already available, digital will be released on the first of June. lechemusic: ¡Meshell Ndegeocello – Petite Mort (Miguel Migs Moody Downtown Remix) lechestyle: ASOS skinny chino! Miguel Migs works his magic with Meshell Ndegeocello’s Petite Mort. This is the sort of track you will hear playing in swanky hotels and lounges this summer. It feels to me like ASOS is moving more and more into the right direction for every season that goes by. 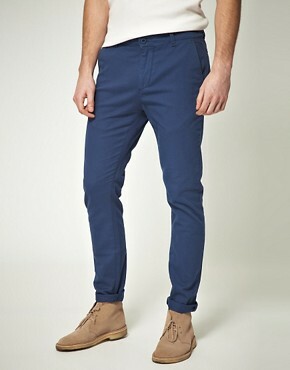 Check out these slim chinos available in a lot of colors. lechemusic: ¡Disko Selectors – Serie Disko 15 – J.A.Z. lechestyle: Karhu Originals Fulcrum Star! Fantastic disco mixtape by J. A. Z. real name John Zahl, published together with Spanish Disko! Selectors. Another great example of how to choose and put tracks together, i will publish a playlist when available. Play this the next time you invite people over for a guaranteed “Great music, what is this?”. Karhu Originals is a legendary Finnish footwear brand. Love some of the color combos they have, and the name Fulcrum Star sounds like a Star Wars fan club. lechemusic: ¡Roberto Rodriguez – Dawn! Helsinki based Roberto Rodriguez album Dawn was released in the beginning of May. The album offers tracks ranging from downtempo electronica to deep house dance. Be sure to preview it below, for a purchase head on to Juno, iTunes, or Amazon. Ryan Gosling shows off a summer trend with a PJ styled navy shirt. Perfect for lazy yet elegant summer days. lechemusic: ¡Emeron & Fox – Dopecity lechestyle: H&M green college jacket! One to watch out for: Brooklyn based duo Emeron & Fox debute single Dopecity is a real nu disco gem. Can’t wait to hear more from them. H&M has a lot of interesting things planed for the upcoming fall. I really like this green college jacket.